Here’s a party anthem! If you ever need a party to go off, drop this track. It also gets you flying on your run. From American hip hop duo Macklemore & Ryan Lewis debut studio album The Heist that also contains the classic Thrift Shop, it’s the anthem, Can’t Hold Us. Maybe it’s not the ceiling we are worried about and more how this joyous mix of rap, gospel and disco will have us chipping alone nicely whilst throwing down some raising the roof dance moves! The official version is 6 minutes long and take 45 second for the track to kick in, so i have included the radio edit here which is shorter and a bit punchier. Check your roof is structurally sound before dropping Track 9. It’s a belter from Macklemore & Ryan Lewis, Can’t Hold Us. 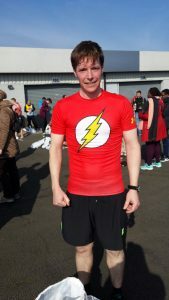 Next Next post: Feeling Better – Its not always about the running!